I went to the Kingston-Port Angeles football tilt last Friday. It was my first trek to Buccaneer Field. The field is very nice, the lights are terrific, and the poor stadium announcer needs a new home so he won’t get wet when it rains! The Kingston football program has struggled for wins since its inception in 2007. This year, I think they have something going on. Coach Dan Novick’s squad lost to PA 14-9, however it was one of those games that they would have won without a few mistakes. Port Angeles scored its first touchdown after a special teams breakdown on a Kingston punt that gave the Roughriders the ball inside the Buccaneer 20 yard line. The second touchdown came on the next Buccaneer possession when Sam Byers was intercepted and the return was for a TD. That’s it. The Kingston defense was tremendous and PA never sniffed the end zone again. Unfortunately, neither did Kingston as a late game drive was snuffed out again by an interception that went off a receiver’s hands. – They play aggressive, physical defense. That will win games. – I really like their QB, Sam Byers. He has a strong arm, is only a junior, and moves well for a guy 6’4. His receivers drop way too many passes, and if that changes, watch out. – They have a strong running game behind Lou Hecker. He is a tough runner with deceptive speed. I like how the team has come around. It’s been a long time coming but the patience is paying off. The Bucs are 2-2 and I see more wins in their future. Game Balls to Leon Washington and the entire defense – with special recognition to Earl Thomas, Lawyer Milloy, Chris Clemons, and Roy Lewis. Special teams kudos to Kam Chancellor for the big strip on Darren Sproles. This was one of those games that is polarizing. It would have been a monumental collapse to have lost, and it’ might be a game changer for the year as a win. Last week against Denver was more ho-hum. We played okay on the road, made too many mistakes and lost. You can live with that. You can’t lose a 17-point lead at home and leave all those “men on base.” What I mean is a ton of lost opportunities to score. The defense came up big with two stands against a hot quarterback and won. BTW – did you hear this stat? In the 2nd half, San Diego had 19 first downs and Seattle had one. One! We won the game with only one first down in the second half. Return yards by Washington and Thomas saved our bacon. There is nothing like Friday night in September in America. All over the country, high schools (big, medium, and small) are kicking off the pigskin in front of family, friends, and community. The weather is turning colder and you can feel football in the air. I’m heading out to Buccaneer Field in Kingston tonight to get my first look at the Kingston High Buccaneers play Port Angeles. I’ve not been to their new field with lights and I’m excited to see it and them. I will add Twitter comments throughout the night and recap tomorrow. We can relax about worrying about Jake Locker’s run for the Heisman Trophy. It ain’t gonna happen. It’s unlikely he will play another team the caliber of Nebraska and this game will dog him for the year when it comes to the Heisman. Maybe he can just relax and play. Golden Tate is a home run hitter for the Hawks. We need to get the ball in his hands early and often. In fact, our receivers played well in Denver. Nate Burleson had one catch for 4 yards and Housh was shut out for the Ravens. I will take Deion Butler, Deion Branch, Golden Tate, Ben Obamanu (TD reception) and Mike Williams over them at this point. The Hawks at least fought until the end. Last year, they wilted. This year, they just didn’t execute well. If you turn the ball over on the road against a team that hasn’t lost a home opener in over 10 years, you will lose the game. Matt Hasselbeck is still healthy after two games (last year injured in Game 2). The win against the 49ers made this game not as important as it was for Denver. Being 0-1 and facing a brutal schedule the next 4 weeks, this was a “must-win” for them. The Seahawks have a tough opponent at home next week (a game they can win), and ext “must-win” for them comes at St. Louis in 2 weeks. Yesterday, we discussed women in the locker room. Today, we discuss women athletes. Particularly those who have made their mark in Seattle sports history. 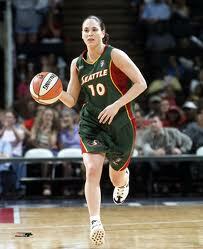 The 2010 Seattle Storm were nearly perfect. They are being heralded as one of the best WNBA teams in history. Unbeaten at home and sweeping away Atlanta in the finals. Lauren Jackson and Sue Bird have now brought two championships home to Seattle. If they were an NBA, NFL, or MLB team in this town, can you imagine the frenzy? I maintain that Jackson and Bird deserve to be placed among the elite professional athletes in this city’s history. No other athletes have had the impact in their sport (other than Ken Griffey Jr) AND the championships that these two have. I know it’s women sports and many don’t think it rivals the men. Hogwash (not quite Rex Ryan, but you get my point)! Jackson and Bird have been among the elite players in the league as well as internationally. They have two rings. Yet, even with a parade tonight, this city (and the nation) still has a ways to go to get them to the respect level they deserve. 1 – Ken Griffey Jr. I think they deserve a spot. What about you? Boy, if only Hard Knocks was still on! The New York Jets have had a tough week. First, they get beat at home by Coach Rex Ryan’s former team the Baltimore Ravens on Monday Night Football. Then, this whole Ines Sainz “thing” happens. Ines Sainz is tabbed as the “hottest sports reporter” in Mexico. She was in the Jets locker room trying to get an interview with Mark Sanchez. Seems like the Jets were making life difficult for her with rude and lude comments in the locker room, and allegedly throwing footballs at her during practice. Sainz apparently didn’t report the recent locker room incident (another female reporter did) but it brings up the question of women reporters in any professional sports locker room for men. Let’s be straight about one thing up front. Harassment can never be tolerated. If male reporters can go in the locker room, women should be able to as well without peril of harassment. What the Jets did was wrong and they are certainly hearing it from the NFL. What each professional sports league needs to figure out is what type of access should be allowed to all the media. My two cents – The locker room should be kept private from the media…all media. This should be the place players are able to relax, vent, and shower after a game (win or lose). Find a different place to address the media. Rope off a section outside the locker room like they do in Europe. Still require players to meet with the media. Basically, allow the players a chance to chill after the game and allow access to all reporters to players. This is bigger than Ines Sainz and the Jets. It’s come up before and it will continue to until some sort of policy is made. The Jets certainly didn’t need another black eye this week. I do guess however, that Ms. Sainz Google hits have increased as well as her 15 minutes of fame! She can thank the Jets for that. OK…I know there is one more game to win, but let’s give some credit where it is due. Seattle is a basketball town and the Storm have ably filled the shoes of our now departed Sonics. Kudos to the ownership group that wrested control away from Clay Bennett. I don’t think Bennett wanted the Storm, however in the WNBA world, the Storm are unique as there are only 2 independent (from the NBA) owned teams. They definitely have the star power with Lauren Jackson, Sue Bird, and Swin Cash. 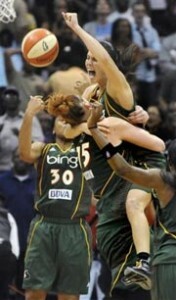 One more win and they will have 2 WNBA titles in the last 5 years. Go Storm! I’m heading to Qwest Field today to catch the debut of the new-look Seahawks led by Coach Pete Carroll. I will be updating you on Twitter (@DailyDanSports) all day. Get the latest on the NFL experience and fantasy football by following and commenting on my Tweets today.